"There are days that define the story beyond your life. Like the day they arrived." 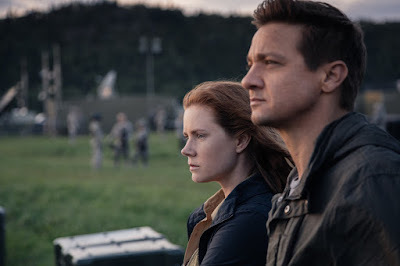 (from guest blogger Amber Armstrong) Arrival is an American sci-fi movie of Canadian director Denis Villeneuve, which came out in the year 2016. American writer Ted Chiang published in 1998 bases the scenario on Story of Your Life. The play opened September 1, 2016. It was released on November 10, 2016. The movie paid off, have been receiving great reviews. 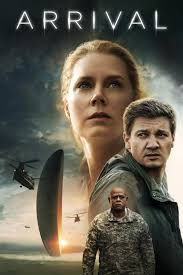 The movie is about huge objects, which appear on Earth all of a sudden. They are called coquilles and allegedly have extraterrestrial origin. Trying to figure out reasons and aims of their appearance, American security services contacted socialists involving a linguist Louise Banks and an astrophysicist. Louise is followed by memories about her daughter who died from a rare disease at a young age. She does not speak their language but she is trying to and gradually she manages to understand what they are trying to say. She gets acquainted with them through communication however she can and she is amazed with new and unknown for her and others but how communication goes and how it gets easy. They exchange messages and there was a moment when she interpreters their words as “get weapon”, which makes other servicemen worry. They take it as a possible message about starting a war. Alien look like earth cephalopods with radically symmetrical bodies and seven tentacles. While trying to get what alien want, Louise realizes that they take time as one more dimension, and therefore, see the future. Louise begins seeing the future just as well. She sees how she met Chinese general, who thanks her for her call, which helped to make their countries united. Louise says that she does not know his number but he shows her his phone saying that now she does. Thus, when the decision about armed conflict is taken, Louise finds out the number of general from the future, makes a call to general and tells him the last words of his passed away wife. China declined its decision, the countries get united and major conflict is prevented. During the last session, an alien explains Louise that they came over to help people but in three thousand years people will help alien themselves communicating. After the conflict is prevented, coquilles of the aliens disappear. A series of Louise` dreams explains problems in private life and partly opens her future to her.